Abilities: The Rocketeer costumes granted their wearers the ability to fly, project bursts of concussive force, and punch with superhuman force. They were considered inferior to the Torpedo costume, which allowed its wearer to fly at 2500 mph and punch through armored aircraft. The Torpedo armor could also absorb and harmlessly dissipate large amounts of radiation; it is uncertain whether the Rocketeer suits could do the same. The Rocketeers carried hand-held energy blasters and missile launchers. They also drove in rocket cars which could also take to the air and be used for flight. (OHotMU DE#20 - BTS / Rom#21 (fb-BTS) / Daredevil#126 (fb - BTS)) - Kligger, the head of the East Coast branch of the Corporation, was also involved with the extra-terrestrials known as the Dire Wraiths. The Wraiths sought his aid in creating a battlesuit powerful enough to defeat their enemy, Rom. It was for this reason that Kligger enlisted his son, Michael, to build a battlesuit. Kligger duped Michael (who still resided in Yugoslavia) into believing that the suit was being designed for national defense. At the same time, Kligger duped his superiors in the Corporation into believing that the suit was being designed to assist in the Corporation's covert takeover of the USA. Michael may have been given a set of initial plans from Wraith scientists. Michael Stivak had perfected the battlesuit, but then learned of his father's plans (or at least those that he had told the Corporation). Angered at the betrayal, Michael designed a much less powerful costume and presented it to his uncle. Kligger, however, learned of the existence of the more powerful suit and tried to steal the suit's only existing plans. Michael donned the suit and took the name "The Torpedo" and set out to destroy the suit's plans, which were kept in a vault in New York. (DD#126 + 127 - BTS) - Michael Stivak was killed while trying to destroy the plans, but he passed the suit on to Brock Jones, and convinced him to continue his mission. Jones, the new Torpedo, successfully destroyed the armor's plans. (OHotMU DE#20 - BTS) - Kligger had a number of replicas of the inferior battlesuit created, supplied them to several of his operatives within the Corporation, and dubbed them the Rocketeers. Wescott was named leader of the squad. (Daredevil I#131 (fb) - BTS) - Daredevil encountered Wescott and the Rocketeers. During this encounter, Wescott shot Daredevil and left him for dead. (Daredevil I#131) - The Rocketeers robbed a jewelry store, but were discovered and defeated by Daredevil. Most of the group was arrested. (Marvel Premiere#39) - The Rocketeers ambushed Torpedo/Jones, hoping to capture the armor, but Jones escaped them. Kligger threatened Wescott for his failure. Another member of the Rocketeers, Number 12, caught up with and attacked Jones again. Number 12 led the Torpedo back into another ambush, but although they did knock him out, they were forced to flee when their struggle drove the nuclear pile in a Con Edison plant to approach meltdown. (MP#40) - Kligger yelled once more at Wescott for not getting the costume, and gave him one last chance to get the suit or he would be killed. Later, Torpedo--having absorbed the radiation and escaped from the previous situation--broke into the office of Senator Stivak. Kligger watched the break-in on a monitor, and sent his Rocketeers after Torpedo once more. The Rocketeers managed to overpower the relatively inexperienced Torpedo, and Stivak had them take Torpedo to his mansion in Westchester. There, Torpedo woke up, and freed himself, managing this time to defeat the Rocketeers and Kligger, and then to escape. (Rom#21 (fb) - BTS) - After Kligger's death, the Dire Wraiths took a more active role in the efforts to obtain the Torpedo costume. A Wraith that had slain and replaced Byron Benjamin (the head of Delmar Insurance - where Brock Jones had been employed) outfitted several Wraiths as the new Rocketeers. These Wraiths successfully determined that Jones was the Torpedo. (Rom#21 (fb)) - A squad of the new Rocketeers stalked Jones at his Westport home. Jones discovered the Rocketeers and attacked them, and those he struck crumbled into ashes. Unaware that these had actually been Wraiths, Jones assumed that he had now become a killer. He took his family and relocated to Clairton, West Virginia. (Rom#21) - Jones, as the Torpedo, attacked Rom, mistakenly believing him to be one of the Rocketeers. After a short battle, Rom explained the existence of the Wraiths and Jones realized that the men he had fought before were Wraiths. Jones, however, had left his new return address on a letter to one of his former co-workers, which was found by the Dire Wraith/Benjamin. Thus the Wraiths tracked Jones to Clairton. 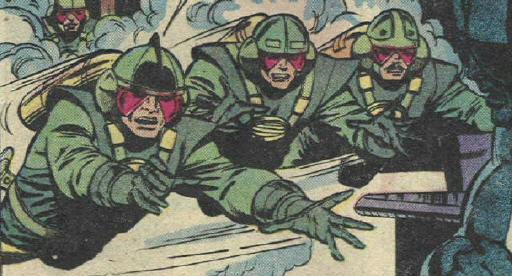 (Rom#22) - The Rocketeers invaded Clairton, assaulting any who observed them. Rom and the Torpedo teamed up and slaughtered the Rocketeers, and the Wraith/Benjamin killed himself to avoid punishment from his superiors. (Rom#50 - BTS) - Brock Jones was slain by the Dire Wraith sisters. The Sisterhood similarly wiped out most of the male Wraiths on Earth in order to take control of the invasion/conquering themselves. (Avengers I#245 (fb)) - A group of male Wraiths, some of the few who survived, sought to escape Earth. With most of their technology wiped out by the Sisterhood, the Wraiths were forced to try to build a new ship, using human facilities. The Wraiths, in the guise of humans, worked out of the Kennedy Space Center in Florida. They sabotaged other projects at the Cape, both to secure needed equipment and to cripple competing projects. As the Sisterhood threatened to track them down, they became desperate. Several of them put on the Rocketeer costumes and began making raids. (Avengers I#244-245) - The Avengers were called in to investigate the potential alien sabotage at the Cape. The Avengers encountered and overpowered the Rocketeers, but a spell from one of the Sisterhood (who had secretly located the group of males) allowed them to escape. The leader of the male Wraiths played his allies for pawns and allowed them to be discovered by the Avengers, which gave him a chance to sneak aboard the now-completed starship and take off. 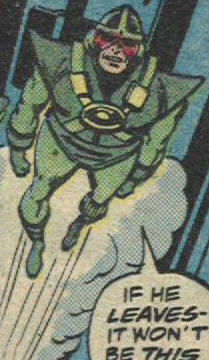 The Avengers stopped the male Wraith leader's escape and returned his ship to Earth, though he was slain in the struggle. Meanwhile, the Wraith sisters captured and slaughtered the remaining males, although they, too, were discovered by the Avengers and slain. 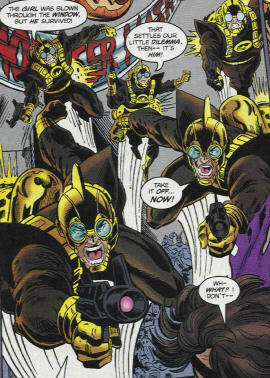 (New Warriors I#73 (fb)) - The Torpedo suit was sent to Phillip Jeffries, Brock Jones' cousin. Phillip's son, Michael, found it and unwittingly gave it to his friend, Mickey Musashi, to wear as a Halloween costume. When she donned the helmet, its activation was discovered by a group of Rocketeers who had been tracking for its power for years. They attacked Mickey and tried to steal the costume. Mickey quickly learned how to use the suit and overpowered the Rocketeers. Comments: Created by Marv Wolfman, Bob Brown, and Klaus Janson. Linked to the Dire Wraiths by Bill Mantlo. 3rd group created by Evan Skolnick and Dwight Coe. Volx, the Dire Wraith Queen, while posing as Michael Jeffries, told the New Warriors that the Rocketeers who had attacked Jeffries and Musashi had admitted that they had worked at the laboratory where the original Torpedo and Rocketeer armors were constructed. Whether this group of Rocketeers were truly humans or Wraiths is uncertain. Almost all other Wraiths--besides Volx--had lost their shapeshifting powers due to the destruction of their home planet, the Dark Nebula, so they may well have been human. They also may or may not have been affiliated with the Corporation. Thanks to Mike Fischer for pointing out the appearances in the Avengers, which I had forgotten.